This man right here is my HERO. I can’t believe we still have truthful people like this in Lagos. I lost my wallet on Saturday, since then I had been disturbed and praying to find it. In it I have 20pounds and some naira notes. 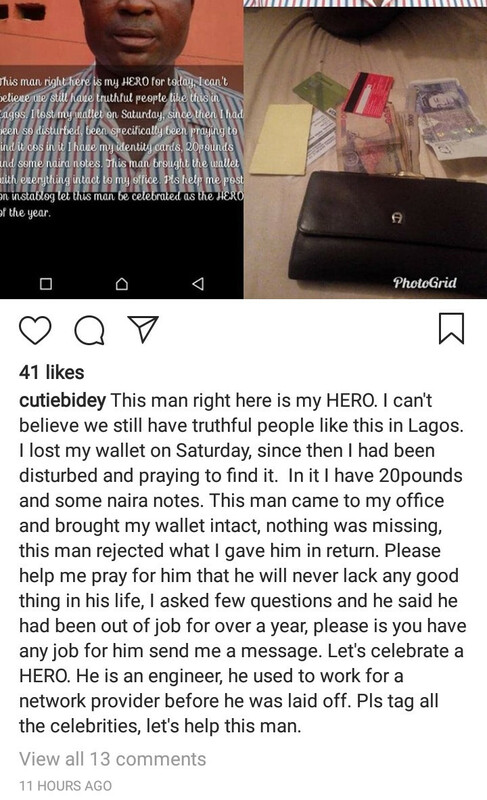 This man came to my office and brought my wallet intact, nothing was missing, this man rejected what I gave him in return. Please help me pray for him that he will never lack any good thing in his life, I asked few questions and he said he had been out of job for over a year, please is you have any job for him send me a message. Let’s celebrate a HERO. He is an engineer, he used to work for a network provider before he was laid off. Pls tag all the celebrities, let’s help this man.